I was in the gallery, in the piracy project reading room, and happened across the text by chance. 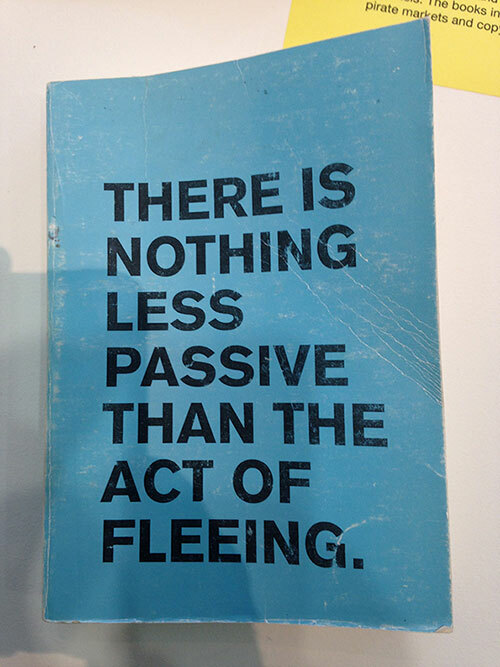 It was in a book titled ‘There is Nothing Less Passive than the Act of Fleeing’, it caught my eye as it did not have any label (most of the books/pamphlets have a green card with them explaining where they have come from). It deals with something most artists have thought about (or at least should have): Quitting, just upping and leaving the art world to it’s own devices….There are some interesting bits that also relate to our recent discussions with Auto Italia South East during their ‘On Coping, A Reading for Liverpool’ visit to Liverpool, especially the Brian Holmes bit at the end….